1 of 4 Heat oven to 375 degrees F. Prick potatoes with a large fork. Bake at 375 F for 45 minutes. 2 of 4 Meanwhile, in a large nonstick skillet, cook beef over medium-high heat until browned, about 5 minutes. Drain off fat; add onion and 1 tablespoon of the taco seasoning and cook 5 minutes. 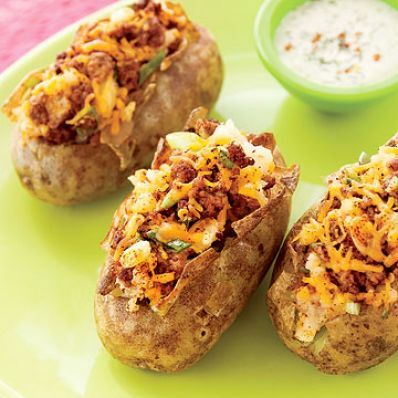 3 of 4 Scoop flesh out of baked potatoes (do not break skins). Place in a bowl; set skins aside. Mash potato flesh; stir in beef mixture, cheese, scallions, black pepper and remaining taco seasoning. 4 of 4 Spoon mixture into skins, packing tightly (bake extra in a small casserole). Place filled potatoes in a dish and bake at 375 degrees F for 15 minutes. Serve with dressing.